Written from a systems engineering perspective, this Field Guide covers topics in optical radiation propagation, material properties, sources, detectors, system components, measurement, calibration, and photometry. Appendices provide material on SI units, conversion factors, source luminance data, and many other subjects. The book's organization and extensive collection of diagrams, tables, and graphs will enable the reader to efficiently identify and apply relevant information to radiometric problems arising amid the demands of today's fast-paced technical environment. 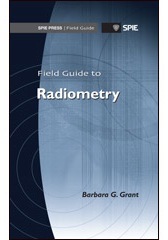 Based on the SPIE bestseller The Art of Radiometry by James M. Palmer and Barbara G. Grant, this Field Guide provides a practical, hands-on approach to the subject that the engineer, scientist, or student can use in real time. Readers of the earlier work will recognize similar topics in condensed form, along with many new figures and a chapter on photometry. Written from a systems engineering perspective, this book covers topics in optical radiation propagation, material properties, sources, detectors, system components, measurement, calibration, and photometry. Appendices provide material on SI units, conversion factors, source luminance data, and many other subjects. The book's organization and extensive collection of diagrams, tables and graphs will enable the reader to efficiently identify and apply relevant information to radiometric problems arising amid the demands of today's fast-paced technical environment. I gratefully acknowledge the contributions to my education and career from three professors of Optical Sciences at the University of Arizona, gentlemen all. They are the late Jim Palmer (1937-2007), who mentored me in radiometry for many years and provided the opportunity for me to complete The Art of Radiometry; Emeritus Professor Phil Slater, who selected me as a graduate student and trained me in remote sensing, and who continues to encourage and support me; and Eustace Dereniak, who generously shared his knowledge from the very first, provided me my first opportunities to teach, and has strongly supported my career for more than twenty years. To all, my heartfelt thanks. This book is dedicated to my family and particularly to the memory of my father, William Grant of Chicago, Illinois, a US Navy veteran of WWII who taught me to play the "Garryowen" as soon as my fingers could reach a piano keyboard.